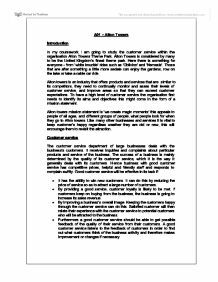 A01 - Alton Towers Introduction In my coursework I am going to study the customer service within the organisation Alton Towers Theme Park. Alton Towers is considered by many to be the United Kingdom's finest theme park. Here there is something for everyone - from 'white knuckle' rides such as 'Oblivion' and 'Nemesis'. Those that are after something a little more sedate can enjoy the gardens, row on the lake or take a cable car ride. Alton towers is an industry that offers products and services that are similar to its competitors, they need to continually monitor and asses their levels of customer service, and improve areas so that they can exceed customer expectations. To have a high level of customer service the organisation first needs to identify its aims and objectives this might come in the form of a mission statement. Alton towers mission statement is 'we create magic moments' this appeals to people of all ages, and different groups of people, what people look for when they go to Alton towers. Like many other businesses and services it is vital to keep customer's happy regardless weather they are old or new, this will encourage them to revisit the attraction. Customer service The customer service department of large businesses deals with the business's customers. It receives inquiries and complaints about particular products and service of the business. The success of a business is mainly determined by the quality of its customer service, which it is the way it generally deals with its customers. ...read more. * Be aware of when to call for assistance * Make sure any further communication is agreed with the guest. Internal customers Internal customers are specific people and departments who need you to help them External Customers There are different types of external customers and they all have different needs. They all expect to have these needs recognised and dealt with, and to be treated well by the members of the organisation. The groups are sorted out by those most frequently used within the travel and tourism industry. Individuals Individuals are those customers who are making enquiries or bookings on their own behalf. They may be independent travellers who contact a variety of organisations in order to obtain information to make up their own package. They may be individuals who are travelling alone on business, who need to arrange transport or accommodation for him or her only. They business traveller may require additional facilities in his or her accommodation, such as a telephone/modem link, wake up calls and newspapers and car parking to leave their cars when in a meeting. Form the above; we can see that there are different expectations of individuals even though they are classed as a single customer category. The responses given must relate to the requests of the customer. Groups These could include families, parties of young people going on holiday together, students on a residential break, or clubs and societies going to events for example Different age groups Groups can be made up of customers of widely differing ages. ...read more. over the summer Alton towers employs more 'casual staff' that can handle high amounts of customers and that can deal with them in an appropriate manner Health and safety If the health and safety of the park is poor the customers will not visit again but if the high standards are noticeable then they will enjoy there visit a lot more, at Alton towers rides have regular maintenance checks and are run in the morning before the park opens to ensure that there are no faults. Cleanliness and hygiene The cleanliness and hygiene standards of Alton towers is essential if the park looks unclean this gives a really bad first impression when the customer see it , the park has been given hundreds of bins, there are also designated litter pickers that patrol the park every 15 minutes, toilets that are all around the park are monitored every 40 minutes to ensure they remain clean and tidy. Enjoyment The main objective at Alton towers is to make everyone's day (who visits the park) as enjoyable as possible, they do this by trying to get lines and queues down as quick as possible, offering people fast track system so the can skip the queues, more fast food restaurants are being introduced this will help to reduce the overall queue times. ?? ?? ?? ?? This document was downloaded from Coursework.Info - The UK's Coursework Database - http://www.coursework.info/ This document was downloaded from Coursework.Info - The UK's Coursework Database - http://www.coursework.info/ This document was downloaded from Coursework.Info - The UK's Coursework Database - http://www.coursework.info/ This document was downloaded from Coursework.Info - The UK's Coursework Database - http://www.coursework.info/ ...read more. By introducing the new values and paths for the employees, change agents tried to shape the employees basic assumptions and paths (Schein Model). Now NHS is applying the combination of different organizational cultures by focusing on the Task culture and empowering employees and patients and much less hierarchical processes. This PEST factor may affect Ginsters because they will need to think about who they are targeting their products at. This is because Ginsters will need to think about the fact that a vast number of the people in the UK are elderly, this means that Ginsters should aim to increase brand awareness for elderly people. GM joint venture, GM also plans to create a research facility in Shanghai for $250m to develop hybrid cars and alternative energy vehicles therefore GM follows a path suggested by dunning to gain advantage in terms of competitiveness and cost by ownership in foreign market and aim to expand. methods are been taken into consideration to get the solution to the research problem. The significant and genuine data is been taken into consideration and it is been analyzed according to the research requirements. This figure will specify the different types of the research methods involved within this research process. We help develop key skills, confidence and motivation, enabling young people to move into work, education or training. They run programmes that encourage young people to take responsibility for themselves - helping them build the life they choose rather than the one they've ended up with. They are usually closed questions; this means that they have set answers that a person then ticks or circles. This is effective because it can be used to gather large amounts of data, it can be represented graphically, they are simple to use and allows the business to ask exactly what it wants. Demand has two categories: elastic and inelastic demands. Since most participants are satisfied with the products that are served in EHB but dissatisfied about the price (See Appendix 1 Q.7), the demand for our products is price elastic. This means greater demand will be obtained when a discount or promotion is applied.